Instructions: Decorated card size is 7 1/2 x 7 1/2". Score and fold 12 x 6" Elegant Eggplant cardstock at 6" on the long side to create 6 x 6" card base. Cut twp 6 x 6 panels from the paper collection, trim to 5 7/8 x 5 7/8" and ink the edges with Majestic Violet ink. Adhere one of the panels to the inside of the card base. Stamp the Cheery Pansies with Majestic Violet ink, color with Majestic Violet, Buttercup and Magenta Hue inks. Stamp the leaves with Olive ink and color with Fern Green. 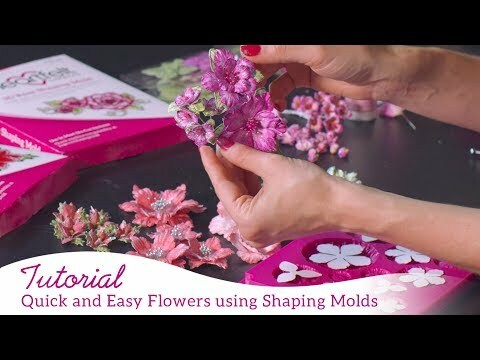 Diecut the flowers and leaves with coordinating dies, place in the Pansy Shaping Mold, spritz with water and run through the diecutting machine. Adhere the flower petals together using dries clear adhesive, press down in the centers using the Deluxe Flower shaping kit, sponge the pansies and leaves with dries clear adhesive and sprinkle with Crystal Clear glitter. Add glue and Heart of Gold Prills to the flower centers. Adhere the pansies and leaves to the card using the hot glue gun as shown. Diecut two eyelet hearts, one smaller than the other, edge both with Majestic Violet ink and on the smaller heart, stamp the sentiment with Majestic Violet, sprinkle with clear embossing powder and heat set using the Heat it tool. Adhere the two hearts together using dimensional dots and adhere to the card base using dimensional dots. Create a multiloop bow, adhere to the card and add a pansy to the center.